There are several ways to determine the shutter lag of a camera such as photographing falling objects, rotating discs or an electronic counter. I chose the digital method, due to a simple implementation and good readability of the results. 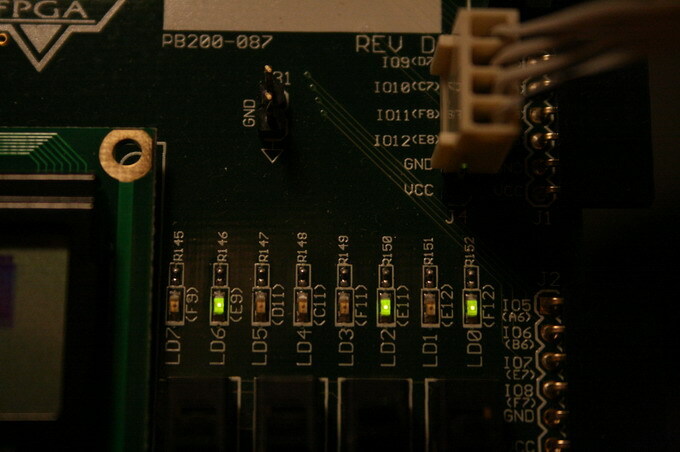 To implement the timer I used my FPGA board on which I implemented a binary 8-bit counter with a time step of 1 ms. This counter was connected to 8 LEDs showing the time elapsed since the triggering. The camera was triggered by an optocoupler to reduce the risk of damage. To record the time stamp the camera was set on manual focus, 1/1250s, f5.6, ISO1600 and pointed on the counter. Having everything working properly I shot some series of test pictures. An example is shown below. The shutter lag was measured with and without mirror lock-up. To make the results more reliable both test series consist of 16 images. Pictures with ambiguous time steps due to a jumping counter were sorted out before the analysis. The results are shown in the histogram below. The bars correspond to the frequency of occurrence for each shutter lag value. 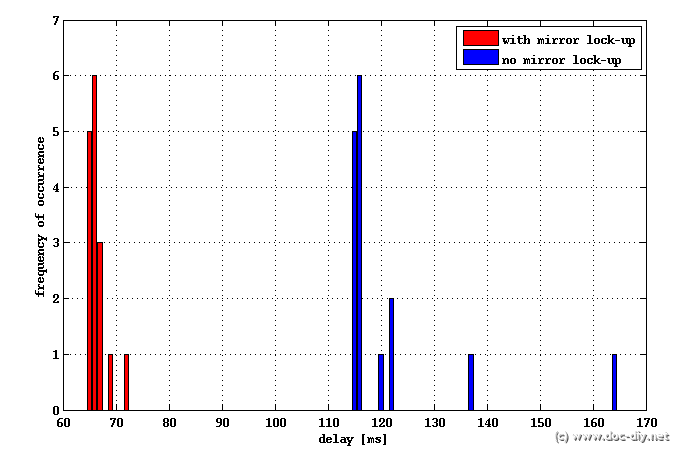 The shutter lag varies around 115 ms for the case without mirror lock-up. Enabling the lock-up mode reduces the lag almost by a factor of two to about 66 ms. An interesting fact revealed by the test is that the shutter lag is not constant. A lag of 65 ms is an average value, but good enough to use the camera with a lightning trigger. A microcontroller based DIY lightning trigger circuit using mirror lock-up is described here. I also measured the minimum trigger impulse duration for reliable trigger operation (see plot below). For pulses shorter than approx. 15 ms the trigger failure rate increased rapidly. The results with the corresponding timing diagram are summarised below. I repeated the measurements later to find out the influence of the aperture setting on the shutter lag. The aperture can potentially increase the shutter lag, because it must be closed each time before the exposure begins. The results were very similar to those described above. The aperture had no influence on the shutter lag. Very cool! Does it work with XLR too?